Higher Grades in 14 Days! “I used the strategies in this program from grade 3 all the way through graduate school to achieve my dream of getting a doctorate.” – Katie Langley, Psy.D. Do you finally want some peace of mind? Then raise grades and test scores as soon as 14 days! Is homework a nightmare at home for you and your child? Do you feel like you’ve tried absolutely everything to help your child get higher grades? Does your child or student seem to know the material for a test, then forgets it during a test? Is your child getting good grades in one subject and not another? Does he or she have trouble reading, writing, in math, history, science or other subjects? Has anyone said your child or student is lazy or simply not trying hard enough? Like every parent and teacher, you want your child to get higher grades, to have an excellent study skills system, a better memory, more confidence, and know how to learn things faster. You also want a more peaceful home life. But you’ve tried so many tips, read so many magazines, talked with so many teachers and other parents, that you don’t know who or what to believe anymore. You just want to stop your child’s suffering more than anything else! Unfortunately, most kids have no idea “how to learn” only because they have no learning strategies. Kids who struggle learning just automatically think that the other kids are smarter than they are. But nothing could be further from the truth. They are simply unaware about what strategies they specifically need to read and recall their reading assignments, how to remember something quickly, what kind of note they really need to take, or even how to outsmart their stress. They may be told to learn something, but never ‘how to learn” anything. The strategy is all about the HOW AND NEVER ABOUT THE WHAT. Some kids have a natural learning modality that happens to match what is going on during learning and testing. But most do not or we’d have a classroom full of kids with A’s. The kids who get A’s just say things like they study or have a good memory – they don’t realize that they are using very specific strategies that work really well in a place we call school. If you keep reading, you’ll discover, step by step, how to use a powerful new learning styles study skills system discovery to get exactly what you want. (Plus, more than 19 learning experts and authors have donated free resources that would normally cost over $900 to help your child, because they believe in the powerful results your child will get when using Instant Learning® For Amazing Grades E-Book and study skills system. 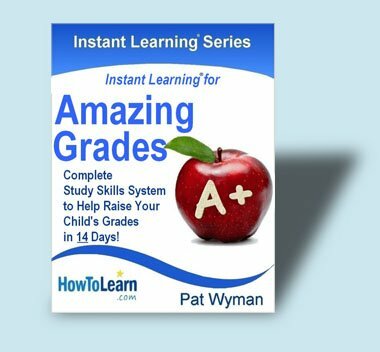 Thousands of parents just like you have used this study skills system discovery in the Instant Learning® For Amazing Grades E-Book and watched their child grin from ear to ear by their very next report card. And that’s where I come in. My name is Pat Wyman and I want to share this learning styles study skills system discovery with you personally. I’m a college professor for teachers, best-selling author of several books, learning and reading specialist, who has who has already helped over one million students use this learning styles study skills system get the A’s and B’s they deserve. The strategies are used in well over 5,000 schools worldwide. I am also an expert in neuroscience, lecture and how the brain learns, and my “insider” information has been featured on radio, T.V. and in national publications including Family Circle Magazine, Woman’s World, The Washington Post and in a cover story with my learning styles study skills system information in Nickelodeon’s Nick Jr. Family Magazine. See If This Sounds Even A Bit Familiar? Russell and Elizabeth were told that Whitney was bright, but not living up to her potential. She was getting C’s, D’s and even some F’s. She didn’t like reading at all and her spelling grades were atrocious. They were told that she could do better if only she would concentrate and apply herself. Everyday, they struggled with homework hassles, tears, angry words, and even a few slammed doors! Right before her tests, Whitney seemed to know the information, but then somehow forgot it and got low test scores. Some of Whitney’s teachers said she might have ADHD and wanted to put her on medication. Some of them said she was just plain lazy. Finally, they discovered a study skills system that changed everything. After using the proven study skills system in Instant Learning® for Amazing Grades E-book Whitney’s grade point average zoomed up to a 3.6! She began to get A’s and B’s in less than a month. Yes, you read it right. This study skills system all it took! There is so much in this study skills system book that is extraordinary! It has changed the lives of literally hundreds of my patients. When children have been sent to me for prescription drugs to remedy their Attention Deficit Disorders, I have told them about the study skills system strategies in this book instead. Rather than needing drugs to alter their behavior, what they really needed was a way to succeed in school. Their faces were jubilant when they came back after a month or so with excellent grades because they had learned “how to learn” with this study skills system. This is a well-researched, easily implemented and compassionate approach to healing those children who need it most. Thank you, Pat. My dear Parent — I promise your situation is not unique. I speak with thousands of parents every year, and hear exactly the same things about their kids. What you need to know is that your situation is NOT hopeless. The problem is that children who suffer from learning challenges have been mis-lead with the 4 biggest myths by well-meaning teachers, other parents and even some learning authorities. The second is that kids with low grades are lazy and unmotivated and simply do not take tests well. The third is kids who cannot sit still and pay attention most likely have attention deficit disorders of some kind. (Believe me, this is a biggy!) ADD or ADHD can very often be something else in disguise. The fourth is that some kids who struggle in school simply don’t like to read, or spell, or do math, etc. (This is one of the worst. It’s only when children constantly experience failure that they don’t want to read or do their schoolwork). The plain truth is, kids love to learn when they are successful. But sometimes, they just don’t know how to “win the school game” and use a terrific study skills system because no one has taken the time to show them “HOW TO LEARN”. Think about it. Every day, your child is given assignments and told what to learn. This is like a baseball coach giving a player a written test to see if he or she can make the team. No one is showing your child “how to learn”. You can’t just tell a child, “learn this for the test”, and then if they don’t do well, blame them entirely. Wouldn’t you agree that it’s crazy to think you’ll get different results if you keep doing the same thing over and over again? If I keep touching a hot stove and kept getting burned – I’d be silly to think the next time I touch that hot stove I wouldn’t get burned. COLORED OVERLAYS – Raise Reading Scores by one year in just one week! You see, I’ve spent a lifetime helping kids succeed and finally completed a comprehensive digital-book called Instant Learning® for Amazing Grades. It gives you a step-by-step study skills system formula for higher grades as soon as you want to begin. It’s different than anything else on higher grades you’ve ever seen. Your child’s learning style may not match the school’s written testing style. If your child’s personal learning style is different than the one used by every school to test your child’s progress, then your child’s grades may suffer. Not from lack of trying, but simply because you and your child have never been shown “how” to bridge that gap between how your child learns and how he or she is tested. Your child needs a study skills system that shows them “how” to learn with specific strategies in each subject area. Ask any teacher this question. In classrooms everywhere, what percentage of kids are getting A’s? Of those few who do get the highest grades, what is their preferred learning style? And finally, how many kids in just the U.S. alone are reading at grade level? You’ll quickly find out that it’s less than 10-15% of kids get A’s. Over 68% of 4th and 8th graders in America are not reading at grade level! Shocking, isn’t it? Next, any teacher will tell you that it’s the high “visual” learners who perform the best, because their preferred learning style traits happen to match exactly the way schools are set up. High “visual” learners who perform the best, because their preferred learning style traits happen to match exactly the way schools are set up. Why Do Kids Who Are Visual Learners Do So Well In School? The quick answer is because their learning style matches the school’s written testing style. Kids who are visual learners are neat, organized, think in pictures and have the kind of “timeline” in their mind that allows them to see the consequences of their actions out into the future. They have and use a visual study skills system. They can also sit still in their desk easily, pay attention for longer periods of time and turn in work that conforms to the neatness guidelines. Visual learners also naturally think in pictures and this is exactly what gives them the edge on written tests. They have converted everything they read and heard into images in their mind – – then, when test time comes, their brains very efficiently and quickly, convert those images to the words they need to answer questions on the test. They have a winning study skills system they are already using and it’s visual! Visual learners can do this all so quickly that it’s hard for other kinds of learners to understand how they do it. And it’s harder yet for parents of kids who are not visual learners to understand what it is that’s causing their child to get lower grades. This all sounds so simple; yet, other kids, with different learning styles like auditory or tactile/kinesthetic, don’t do what visual learners do naturally. It’s not because there is anything wrong with them, it’s just that no one’s analyzed exactly how schools are set up, or shown them how to add the visual learning style traits they need to succeed in school. If your child is not a natural visual learner, this mis-match between how they learn and how they are tested may result in a lifetime of problems in school. Children who learn in other styles are usually gifted athletes and musicians, and you want to make sure you value and respect their preferred learning styles. Some kids learn best by listening, some by physical, tactile methods– but when it comes to high stakes tests like the No Child Left Behind exams, new Common Core Standards, SAT’s and ACT’s, how many are given out loud, or let kids build models to show what they know? What’s really going on is that kids whose learning styles are more auditory and kinesthetic don’t happen to match they way they are being tested (In the visual, written style). So, they struggle needlessly, and everyone begins to wonder why they are not trying hard enough. This is the reason that Instant Learning® for Amazing Grades E-Book and study skills system is so important and so different. It’s the first study skills system resource of its kind to respect your child’s learning style, and empower your child by showing him or her “HOW” to add the visual learning style strategies they need to succeed in school. Remember, schools cater to highly visual students and it’s in your child’s best interest to learn how to play the Visual learning style game. You’re giving them the extra tools and a simple to use study skills system they need to succeed in the visual world called “school”. The Personal Learning Styles Inventory! Remember, you can’t just “tell” a child how to add visual learning style strategies, you have show him or her exactly how it’s done. That’s why Instant Learning® for Amazing Grades E-book and colored overlays in the Learning Styles study skills system is your child’s personal coach, and precisely why they get results so fast. Okay, So What’s The Cost For This Lifelong Learning Success Resource? I recently saw a commercial on television that asked, “When is a single bottle of diet pills worth $153.00?” The answer was, “When It Works.” Let’s do a quick comparison – last time I checked, some educational products sold on TV would set you back $150.00 dollars. Or you could pay $1,000 or more for testing and tutoring sessions. The other option is for you to buy up all kinds of expensive books and tapes on learning that will most likely only sit on your shelf gathering dust. So imagine what it would feel like if you did not need a tutor at all. 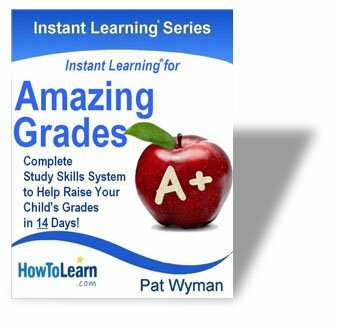 This easy to use, comprehensive E-book and study skills system inside Instant Learning® for Amazing Grades, is available to you as a downloadable book directly from the Internet. Just have the free latest version of Adobe Acrobat Reader installed on your computer. Get Instant Learning for Amazing Grades 210 page E-book book now for less than the cost of one tutoring session. Solve reading problems by finding out how the world looks through your child’s eyes. If you’ve tried everything imaginable to figure out why your child isn’t reading at grade level, doesn’t like to read, or seems to struggle in any way while reading, here is the one item that will finally tell you why your child struggles in reading and what to do about it. 90 Minute Interview with Pat Wyman, America’s Most Trusted Learning Expert, answering the top 21 questions that parents and teachers have about how to help their child get higher grades. Includes tips on motivation, eliminating test-taking anxiety, reading improvement, how to raise spelling grades, and much more. Full of proven tips and easy to use strategies to help your child. This 60-page e-book companion guide for parents and teachers includes Success Principles and exercises that will help students increase their self-esteem, learn to get along with fellow students and siblings, increase enthusiasm for learning, and create more success in their life. A great tool to use in the classroom or at home. Rebecca Kochenderfer, Author and Founder of Homeschool.com, compiled a resource that every parent and teacher needs. The top 100 educational websites include resources such as: worksheets for math practice at home; creative writing and art projects; and free printable books for early to fluent readers. This item is a must have for your child. Rebecca’s article on the 5 Homeschooling Secrets is one that will teach your child or student how to learn for a lifetime! It is truly priceless. This amazing three-week e-course will show you how you can literally reach your goals automatically! Imagine being able to achieve more – automatically; improve your health – automatically; motivate yourself – automatically, and more. Frank Barnhill, M.D. is one of America’s foremost ADD/ADHD experts. He is the founder of DrHuggieBear.com, and provides practical and exceptional advice, which is like having a doctor at the click of a mouse. His resource articles, both in this free bonus and on his website, will save you thousands of dollars in medical fees and gives you the final word on how to help your child and determine whether he or she has ADD/ADHD, how to treat it properly, and how to find out whether the treatment is working. Dr. Barnhill is a highly sought after seminar presenter and maintains a large family medical practice in South Carolina. If you have ever belonged to a group that shared your principles, you may have noticed the feeling of teamwork, the spirit of the organization, and the way all members pull together to achieve a common goal. The 8 Keys of Excellence studied successful people and identified and presented the traits they share. This video is a unique presentation of those traits, that you can share with your children. Bobbi DePorter is best selling author of Quantum Learning, Quantum Teaching, and the facilitator of SuperCamp, which has positively affected the lives of over 32,000 children. You can find out more at QuantumLearning.com. Diane Mierzwik, author of Quick and Easy Ways To Connect With Students and Their Parents and founder of DianeMierzwik.com has a very helpful month at a glance calendar with inspirational quotes and reminders about the easy things you can do each day to make connections with students and their parents. These connections build better home-school relations and promote higher student achievement. This e-book includes examples and templates of notes to and from teachers. Kayla Fay is the founder of GoAskMom.com dedicated to practical tips on life with ADHD/inattentive kids. Her creative newsletter, “Who Put The Ketchup In The Medicine Cabinet?” as well as the practical tips included in Letters To The Teacher will help every parent who has a child with ADHD. Together these FREE bonuses are worth more than thirteen times your investment in the Instant Learning® for Amazing Grades E- Book. But they’re all yours absolutely free! Can I help your child get A’s and B’s, and help you get a more peaceful homelife with this study skills system? The only way to really find out is to try everything in my book entirely at my risk. Instant Learning® for Amazing Grades E-book and colored overlays comes with a 100% no-questions asked, risk-free money-back guarantee for 60 days. I personally guarantee that you’ve never heard or read anything like it. If your child isn’t getting higher grades by honestly following the 14 day study skills system plan inside, and you aren’t feeling happier with your child’s progress after downloading the E-book and using the colored overlays, simply contact us and we’ll cheerfully refund your purchase and you still get to keep all the bonus resource items. If you are ordering internationally, we’re sorry, there are no returns on digital products. There is absolutely no way that you can lose – except by not taking me up on this risk-free examination of Instant Learning® for Amazing Grades E-book and colored overlays. Your overlays will arrive in just a few days! P.S. If you continue to think the same way about your child, and believe that he or she isn’t trying hard enough, you’re going to get the same results. What I’m offering you is the easiest, most risk-free way to try the book and the colored overlays so you can see for yourself how these scientifically developed strategies and study skills secrets can help your child increase their grades, improve your home life, and help you achieve the success for your child you have always wanted in one easy-to-use study skills system.